With so many types and styles of mirrors out there in the market one can get confused since it is not easy to make a right choice. 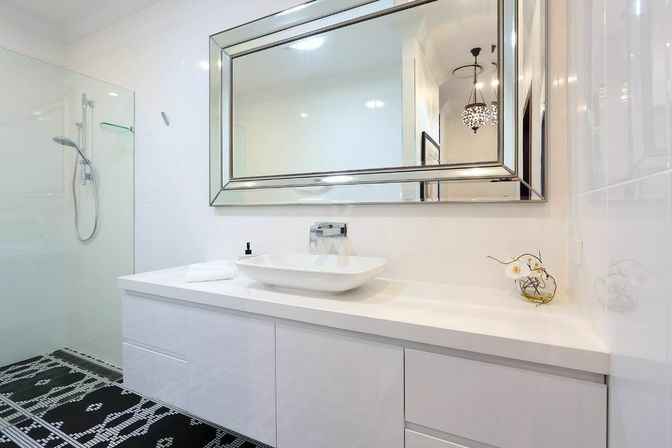 Among many others, one of the main questions you would face choosing a mirror for a bathroom is whether to buy a mirror with a frame or frameless one. 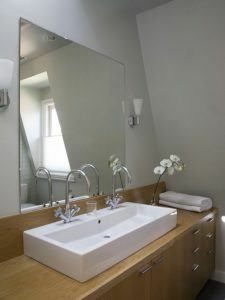 If you can’t make up your mind, it may be a good idea to get a frameless bathroom mirror. 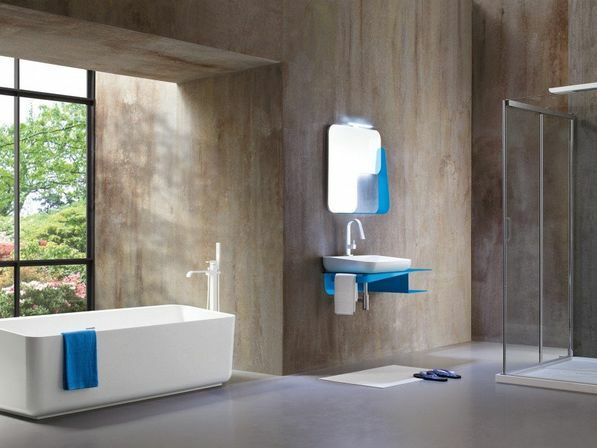 Here we highlight some advantages of frameless mirrors for bathroom that make them a purchase you would not regret. 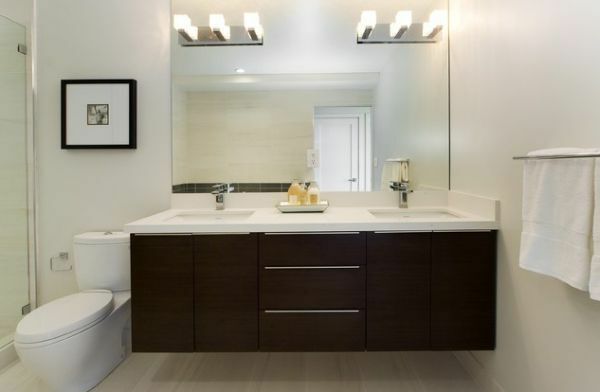 Frameless bathroom mirrors are perfect for minimalistic interiors. 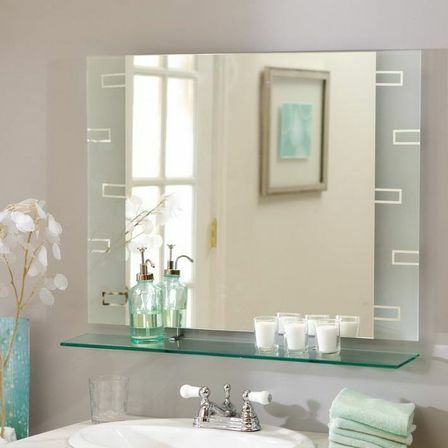 It will fit well in a simple laconic project where decorated mirrors would look out of place. 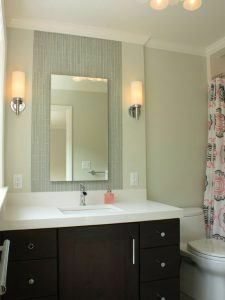 Choosing bathroom frameless mirrors might be the best way to go if a room is tiny. While décor looks exaggerated and sharp edges of frame enhance the lack of space, frameless mirrors work perfectly to make a room look more spacious. A set of frameless bathroom mirrors can be used to create an optical illusion of a bigger room. It can be achieved by placing one mirror opposite the other. Another way is to set two frameless mirrors in the corner of two adjacent walls – it does the trick of eliminating borders. You can give your bathroom an interesting modern look by hanging on the wall several frameless mirrors of different shapes and sizes. The main trick here is to choose the ones that complement each other instead of contradicting and place them all on the one only wall. Otherwise you risk getting a comic grotesque effect instead of polished modern look. Frameless mirrors of unusual or asymmetrical shapes – from star to butterfly – can look quite appropriate while framed ones would be definitely too much. If you can’t find a mirror of desired shape or if you want to remodel your old plain rectangular or round frameless bathroom mirror, you can have it cut according your own designs. 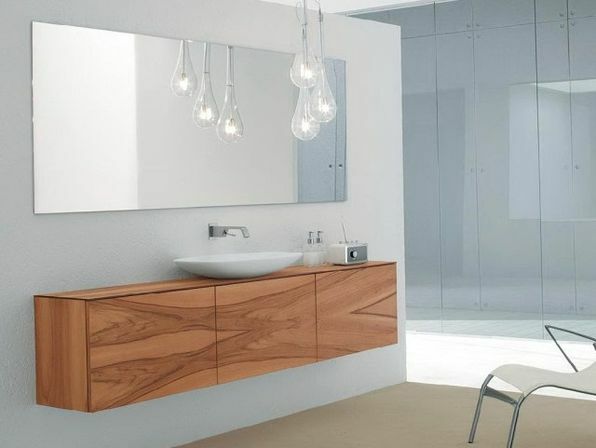 Thus, by means of frameless bathroom mirrors one can materialize bold design ideas such as school of mirror dolphins along the bathroom wall. 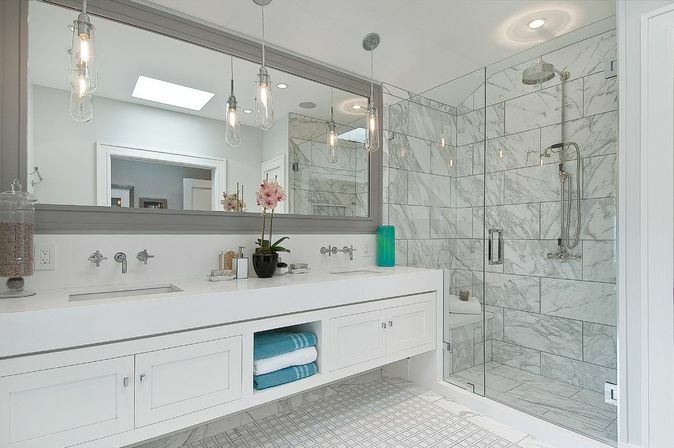 Recently it became trendy to add mirrored elements among bathroom tiles. 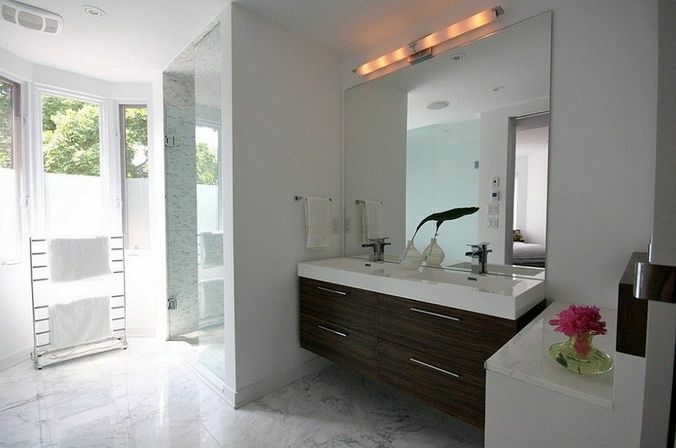 Frameless bathroom mirror will look very natural in this kind of interior. 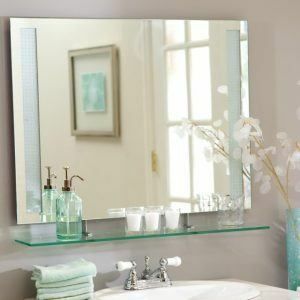 In addition to a mirror above the sink, rectangular frameless mirrors can be put on the door or on some pieces of furniture as tall cabinets. Or you can even make a whole wall covered with the same rectangular frameless mirrors. Such a mirrored wall makes borders vanish away and gives an optical illusion of infinite space. 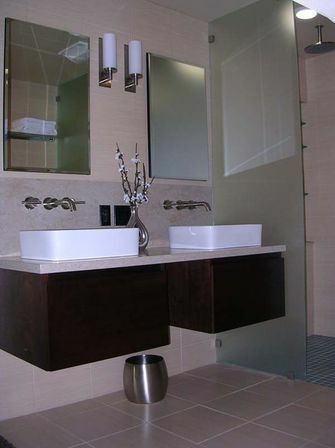 Frameless mirror can be fixed on the same level with bathroom tiles. This style would look especially interesting with mosaic tiles. Tiles of a contrast color could form around mirror some sort of a frame. After all, if you finally get tired of basic simplicity of unframed mirror or if you plan renovation of your bathroom and want to style your mirror to match a new interior design, it can be easily transformed by framing and decorating. 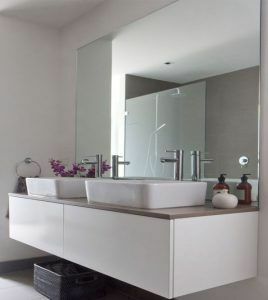 How to change a style of frameless bathroom mirrors? Here are some ideas on how to give an old unframed bathroom mirror a new life. One of simple and budget ways to change mirror’s appearance is to buy some stickers – plain or textured and even some stick-on decors and figures – and decorate mirror’s surface with them. These can easily be removed once you want to change style and cost literally nothing. Make sure that those stickers are waterproof and are especially made for bathrooms. There are many ready-to-use frames in the market which can be easily attached to any mirror. They usually come together with sticky tape so they are specially designed for easy use at home without a help of professionals. This is how it works: one has to measure a mirror that needs to be framed, then order appropriate frame and finally secure it to mirror’s surface. These frames come in various designs, colors and textures – from rustic to modern and classic – and are made from different materials. If you are not sure if the frame is waterproof then you can coat it with waterproof lacquer or transparent paint. Another creative way is to paint along a mirror ornament as on bathroom tiles, using acrylic paint. One can first make a mold of needed ornaments. This would form a sort of frame around frameless bathroom mirror. Very interesting look has a mirror made of figured macaronis glued along the perimeter of frameless bathroom mirror. After all macaronis are secured according with design, a mirror and a wall need to be covered for using a color spray. You can also glue to mirror’s surface any other beautiful things as colored glass drops, rhinestones and seashells. The key to a beautiful design is making sure that all decorative elements match well with the colors of the room and not overdoing it. Yet another way is to put silicon hermetic along the perimeter of a frameless bathroom mirror and then to stick decorative elements into it.